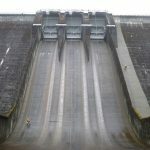 Vertical Access was retained by Puget Sound Energy (PSE) to investigate and document the existing conditions at the Lower and Upper Baker Dams on the Baker River near Concrete, WA. The survey included hands-on inspection and hammer-sounding of the concrete and documentation of existing conditions using a combination of annotated elevation drawings and high-resolution digital photography. The Lower and Upper Baker Dams are located on the Baker River, a tributary of the Skagit River in northwest Washington near the town of Concrete. Completed in 1925, Lower Baker Dam is a concrete gravity-arch dam at the south end of Lake Shannon. 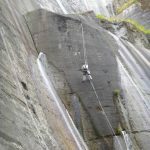 The dam is 285 feet high and measures 550 feet across at the crest. 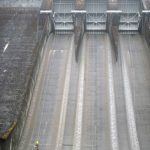 Twenty-three spill gates run across the top of the dam, with non-overflow sections to the east and west of the spillway section. Upper Baker Dam was completed in 1959 and is about nine miles upstream from Lower Baker Dam, at the west end of Baker Lake. Originally called Center Dam, it was designed by Stone & Webster Engineering Corporation for the Puget Sound Power & Light Company. 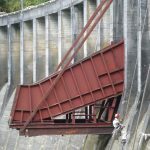 The gravity dam is 312 feet high and 1200 feet in length. The spillway is 112 feet across at the crest near the south end of the dam and has three Tainter gates. The ogee face of the chute gradually flattens to the apron surface. The concrete training walls on the north and south sides of the spillway measure approximately 15 feet high on the inboard side. Perform hands-on inspection of concrete surfaces over large areas, without access to the bottoms of the structures. Map out conditions and collect quantity information for use in prioritizing repairs to dams. Utilized rope access to gain hands-on access and most efficiently perform inspections while descending and ascending. Used TPAS® to document locations and quantities of conditions and to catalog hundreds of photographs. 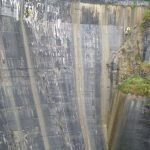 Alta Access designed and installed a horizontal lifeline system on the outboard side of the dam’s spillway. The system enables safe access to a previously inaccessible area at the site.